A custom Protea 1500 Smoke for The Ritz-Carlton Chicago. South African lighting company Willowlamp recently designed one of its largest order of chandeliers for a villa in Dubai, UAE. Known for its exotic designs inspired by nature and geometric patterns, Willowlamp supplied 64 lights with a mix of Protea and Mandala designs. These also included pendants and table lamps in various sizes from its basic collection. 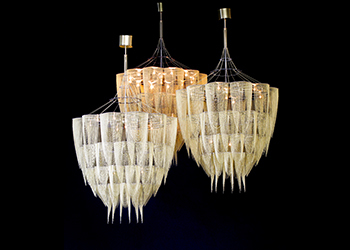 The other stunning design that made up the bulk of this order, is the Protea chandelier. Once again, using sacred geometry, Willowlamp pays homage to the national flower of South Africa with multiple tiers and a chain that hangs in layers of looped petals. For the order, the Proteas were tailored at different heights including 1,200 mm (standard), 1,600 mm, 2,000 mm, 3,700 mm and 5,400 mm. Protea ... pays homage to the national flower of South Africa with multiple tiers and a chain. 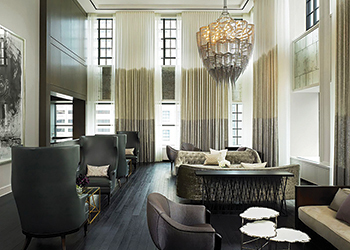 “The order was completed with two different sizes of the circular cropped table lamps and pendants. These drum-shaped lights are available as pendants, table lamps or standing lamps in a variety of sizes and features the signature ball chain design that Willowlamp is known for,” the spokesperson adds. All Willowlamp designs can be tailored in various finishes and specifications to suit individual needs. Production takes six to 12 weeks resulting in beautifully unique pieces. The company has been associated with projects in the Middle East for many years. It supplied Droplet 700 and Protea 700 to Al-Nooh Wood Design and Spiral Nebula to Horizon Interiors, Bahrain. For Mena House Hotel in Giza, Egypt, it custom-designed an oversized version of its ‘Flower of Life’ chandelier in chrome that weighed around 400 kg, was 6.5 m in length and 2.7 m in diameter. It has custom-designed Protea 1300 for the Four Seasons Hotel Riyadh in Saudi Arabia. In conjunction with Roots Design, the company has supplied to three projects in Saudi Arabia. It has also carried out several projects in the UAE including the Liwa Suites (custom pieces) and Shangri-La hotel Abu Dhabi, both in Abu Dhabi; and The Ritz-Carlton Dubai and a batched order for Thani Investments’ Dubai Golf City villa. Other assignments in the UAE include a project in Sharjah that involved the supply of standing lamps for Murano Lighting. The order for Thani Investments was one of the most challenging projects executed by Willowlamp in the Gulf region. “Projects with special requests or custom work are always challenging. For this Dubai project, we were under very strict deadlines and needed third-party involvement for certification. Some countries, including Saudi Arabia, require specific tests to be done before the import is allowed. These certification tests are done by third parties and are very rigorous,” says the spokesperson. The Mandala designs ... for the villa in Dubai. Since its inception in 2005, Willowlamp, with architect Adam Hoets at the helm, has pioneered an innovative and artisanal method of producing highly intricate and unique decorative lighting, using nature’s blueprint as inspiration. The result is a brilliant array of objets d’art that now suspend from the ceilings of globally renowned hospitality, retail and commercial sites. 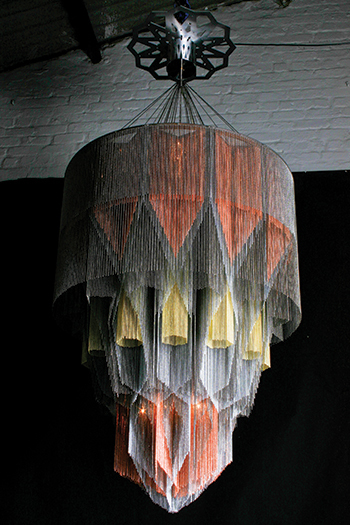 Hoets devised an ingenious system of attaching ball-chains to laser-cut steel frames to create a curtain of chains. This technique produces a collection of softly swaying pendants and architectural pieces with raw material or brightly hued finishes. With ethereal descriptions like the ‘Enchanted Faraway Tree’ or ‘Moonflower’, these artisanal works have captured hearts and garnered an impressive collection of design awards. Willowlamp’s signature pendants emit not only light but also creative energy, and this is a key part of the brand’s ethos.